Astrophysics developed by nineteenth century Allegheny Observatory Astronomers Samuel Pierpont Langley and James E. Keeler. Celsius (temperature scale) - Imprecisely known as Centigrade, in previous decades. Centigrade (temperature scale) - Imprecise term for Celsius. Having no formal astronomical definition, "cross-quarter" here is defined as the moment in time precisely half-way between an adjacent equinox and solstice, or adjacent solstice and equinox. Double-shadow transit - Shadows of two objects transiting or crossing the visible disk of a third object. Often used in reference to shadows of two of the Galilean moons crossing the visible disk of the Planet Jupiter. Equinox (EQX) - The Spring or Autumn quarter begins as the Earth's terminator, the boundary-line between night and day, momentarily crosses the North and South Poles. Therefore, with the Earth's day/night bounary line briefly poised simultaneously over both poles, only on dates near these times of year are the number of hours of night and day equal all over the globe. Minimum (Astronomy definition) - minimum brightness observed or predicted, often for a variable star. Orbital Periods - Sidereal Period, Synodic Period, Draconic Period, Anomalistic Period, Tropical Period. Seasons - The annual spans of time framed by the solstices and their adjacent equinoxes. Of course, although the dates of the solstices and equinoxes remain the same, the season's name will be its opposite when comparing Southern Hemisphere locations to the Northern Hemisphere or vice versa. ** Seasonal Quarters - Although each "season" actually contains a slightly different number of days from the other three, "quarters" remains a common descriptive term for these four sectors of the Earth's orbit. ** Seasonal Weather - The local weather norms traditionally associated with a time of year. All annual extended weather sequences ultimately are driven by the effects marked by the astronomical quarterdays (the solstices and equinoxes) which frame the seasonal quarters of the year. Solstice (SOLC) - Either of the two extremes of the Earth's constant 23.4-degree axial tilt, relative to the sunlight falling on its surface. 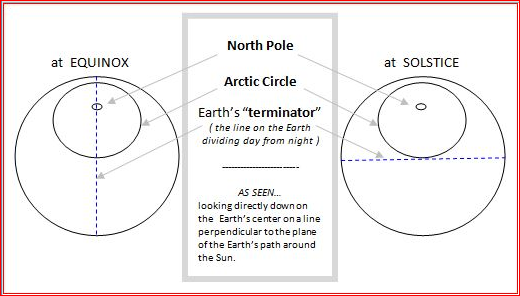 Only at the June Solstice is the Earth's North Pole tilted the full 23.4 degrees towards the Sun...and only at the December Solstice is it tilted the full 23.4 degrees away from the Sun. How the Earth's Terminator was used to help save the Apollo 13 spacecraft. Contact Web Site Administrator: < astroglossary@planetarium.cc >. Last modified : Sunday, 17-Feb-2019 14:49:40 EST. You are visitor number , to this web page, since 2014 January 17.